Andie Mitchell's childhood was less than ideal. With an alcoholic, depressed father prone to rages, and a mother who carried the household on her back while working four jobs to pay the bills, food became Andie Mitchell's best friend, baby-sitter, and companion. Most of all, it helped her to deal with how hard things were at home and how alone she felt. Coming to terms with being "the fat girl" in high school, Andie seemed to progress into adulthood with minimal scars. She had boyfriends and best friends and a college acceptance. However stepping on the scale when she was twenty led to the shocking realization that she weighed 268 pounds. Well on the way to morbid obesity and numerous health problems, Andie was forced into the realization that she needs to find a way to lose weight. What follows is her journey- raw and emotional and real. Andie is not someone who wishes to present herself as the perfect person, or as someone who dropped the weight effortlessly. She presents herself as someone flawed and human and wanting acceptance and love more than anything. This is her story- her story of finding beauty within herself, of overcoming a difficult childhood and an eating disorder, and of finding out that inside it was really her all along. I truly can't convey to you simply using words how deeply It Was Me All Along touched me. I related to it on such an intensely personal level and I couldn't bear to put it down for long! I read at the gym, at work on my breaks, and at home. Not only is her writing exceptional (I would read anything that she's written, whether it be fiction or non-fiction, based on the beauty of her writing alone), but Andie's story is one that I saw myself in many, many times while reading the book. If you've ever looked in the mirror and hated what you saw, if you have ever wondered how the whole sleeve of cookies disappeared in one sitting, if you have ever examined the excess flesh on your body and absolutely despised it, then Andie understands. If you'd rather read than exercise, then she gets it. I had a wonderful childhood, while Andie's was tumultuous, but I still found so many similarities between our thought patterns and bad habits. Perhaps the reason that I loved this book so much is because while I was reading it I kept thinking to myself "She really gets the pain of being overweight. She truly understands the struggle". Not only does she understand the plight of the overweight person so well, she manages to put things about being overweight into words that have only been shadows of thoughts in my own mind. Andie shares her journey towards weight loss with us in such an honest way, chronicling her ups and downs, her missteps and her triumphs. Through it all, and with a lot of hard work and trial and error, Andie seems to find a balance between being thin and being fat, with being obsessed and not caring at all. While her story is far from preachy, I even found a few tips in there that I can easily apply to my own life when it comes to moderation and eating healthfully. If you've ever been overweight, read this book. If you struggle with your relationship to food, read this book. If you've ever felt so alone that you think that no one could possibly understand how you feel, read this book. 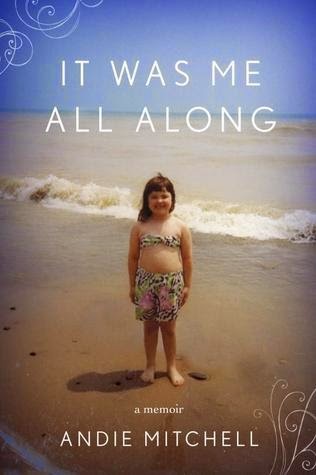 It Was Me All Along is one of my favourite books of the year so far and I won't stop recommending it until everyone I know has given it a chance.